2018 is coming to an end, but that doesn't mean your sustainability actions have to! Use the holiday season this December to shop sustainably for your family and friends by buying gifts locally. Shopping at locally owned businesses or buying products produced in your state makes communities stronger and keeps jobs and money in the local economy longer. Bonus points if you buy gifts that are useful, sustainable, and reusable, and wrap it in recyclable, reusable, or compostable packaging! Happy holidays from tSR! Learn more about shopping locally in Arizona at https://www.localfirstaz.com. Highlight your favorite local businesses and show us your awesome holiday gift finds by using the hashtag #sustychallenge2018 on Facebook, Twitter, and Instagram or commenting below. 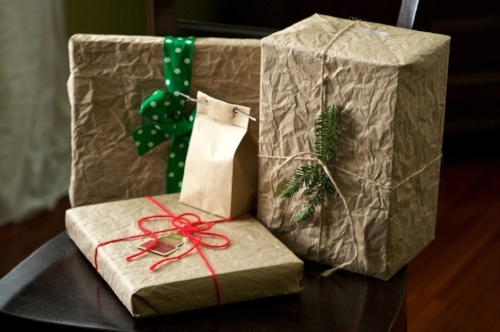 Sustainable gift wrapping inspiration. Happy holidays!